I am an idealist. I like to believe that we live in a post-prejudice world – a world where anyone could become a CEO through determination and hard work, where being in an inter-racial or inter-ethnic relationship is not a stigma, and where there exists universal education for all. As one might imagine, when our prejudiced world snaps around and bites me, it always takes me completely by surprise. Of course, prejudice does not just manifest itself in action, but also in thought – which poses its own problems, as they are nearly impossible to detect and correct. I graduated from Wofford College, a small liberal arts college in the southern United States. Despite the excellent instruction it now provides, it has a troubled history: not only was the main building constructed by African American slaves before the Civil War, but also it was not until the late 1970s that the institution began accepting women as students. I had never really given the latter issue much thought until one day in December 2012. After giving a presentation to a prominent service club in the community, an older man stood waiting for me near the door with tears in his eyes. He started into a monologue about how all of the men in his family were Wofford grads and how all of them thought it was a terrible mistake to accept women as students. He looked at me and said, “I don’t think that way anymore and I am sorry that I ever did.” Apparently, my presentation of the linguistics of classical musical Christmas traditions of different cultures throughout history had enlightened him to the fact that women can indeed be intellectual creatures. I didn’t know whether to smile in relative triumph or leave in frustration at the existence of the prejudices that still existed in 2012. When I first started reading books on Africa, my cousin who works in African infrastructure at the World Bank was very excited. She began sharing with me all of the numerous and inspiring African women who have taken leadership roles in the continent’s development. 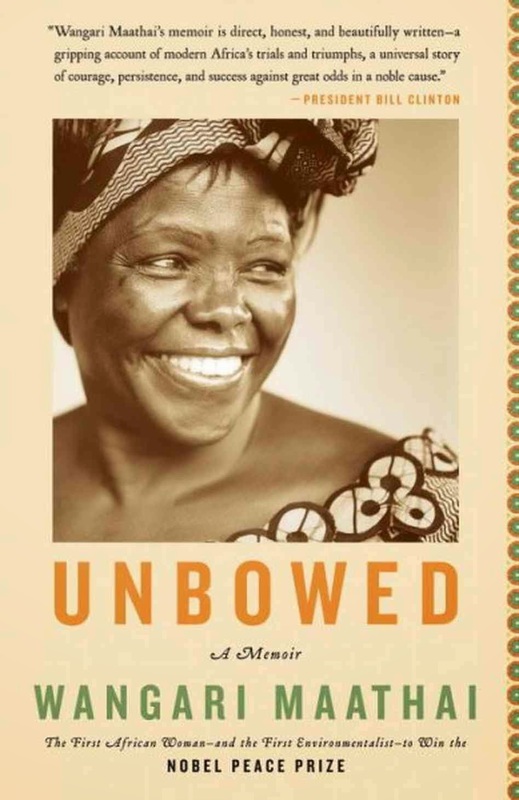 This is how I came to know about Kenya’s Wangari Maathai (the first African woman and the first environmentalist to win the Nobel Peace Prize) and chose to purchase her memoir, entitled Unbowed. Wangari Maathai died in 2011, but her legacy will be felt for years to come. Who was she? On top of a Nobel Peace Prize winner, she was a Kenyan; a member of the Kikuyu tribe, during a time that this meant that she was subsequently considered suspicious under the government; once detained by colonial forces; a United States university graduate; a graduate student in Germany; the first woman to receive a doctorate degree in East Africa in 1971; a college professor; a mother; a divorcee during a time when it was taboo; an environmentalist; jailed for “disrespecting” the court system; the founder of the Green Belt Movement; a political activist; an author; a member of the Kenyan Parliament; and a spokeswoman for democracy. Being an Educated Woman during a Time when Women Were Supposed to be Subservient: Wangari discusses the painful nature of her divorce in 1979 – which was played out on a national stage, as her husband Mwangi was a member of Parliament. Although she did not hear this directly from Mwangi’s mouth, she notes that, “During the trial, Mwangi was quoted as saying that he wanted a divorce because I was ‘too educated, too strong, too successful, too stubborn, and too hard to control.’” (page 146) Wangari was indeed an independent woman, and even held a higher educational degree than her husband. To add insult to injury, a statement that she gave to the press in regard to the decision of the court (it should be noted that she wanted to stay married and her husband asked for the divorce) was viewed as slander and she was subsequently sentenced to a jail term of 6 months. When she was released from jail, she found herself without a job or enough money to support herself. Needless to say, I found Wangari’s professional work just as inspiring as her personal fight against prejudice. The idea that she sought to utilize women (a group which was overall marginalized in Kenya) for environmental change gave these women an opportunity for their voices to be heard and the organization evolved to meet their burgeoning political needs. Wangari stated, “Democracy does not solve problems. It does not automatically combat poverty or stop deforestation. However, without it, the ability for people to solve problems or become less poor or respect their environments, I believe, impossible.” (page 289) While I believe this to be true, she leaves out a key component of the equation for functioning democracy: the sacrifice and examples of people such as herself, striving to overcome societal prejudice.